John Brennan is shown speaking here at the Richard Nixon Presidential Library in Yorba Linda, Calif., in 2016, when he was serving as CIA director. Brennan says he is considering a legal challenge to President Trump's decision to revoke his security clearance. Trump said last Wednesday he was taking away Brennan's security clearance, citing Brennan's highly critical remarks of the president on social media and television. 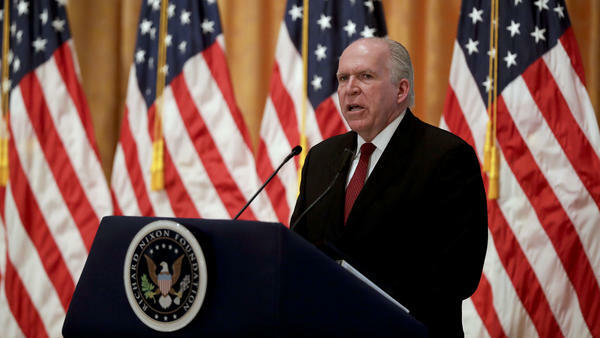 "If it means going to court, I will do that," Brennan told NBC's Meet the Press on Sunday. "If my clearances and my reputation — as I'm being pulled through the mud right now — if that's the price I have to pay to prevent Donald Trump from doing this to other people, to me, that's a small price to pay." In the letter released Monday, 177 former officials signaled their support for Brennan. "Former government officials have the right to express their unclassified views on what they see as critical national security issues without fear of being punished," said the former officials, who served in the military, State Department, Justice Department and a range of security agencies. The list includes Democrats and Republicans. More than 10 former ambassadors and more than 20 former U.S. attorneys signed on. Anthony Lake, a national security adviser to President Bill Clinton, and Bill Burns, a top State Department official for many years, were among those who took part. As with the two earlier letters, the former officials said their show of support does "not necessarily mean that we concur with the opinions expressed by Former CIA Director Brennan or the way in which he expressed them." But they added: "The country will be weakened if there is a political litmus test applied before seasoned experts are allowed to share their views." A group of 15 former national security officials, most of them ex-CIA directors or deputy directors, wrote a letter on behalf of Brennan last Thursday. Another group of 60 former security officials followed up with a similar letter on Friday. Several million Americans, including current government workers, civilian contractors and former officials, have security clearances. When security clearances are revoked, it is almost always handled internally by the government department or agency that an employee is working or used to work for, according to Mark Zaid, a Washington lawyer who has handled hundreds of cases involving security clearances. Brennan could appeal to the CIA to have his security clearance restored, according to Zaid. He could also challenge the president in court. Presidents have extremely broad powers when it comes to national security questions, and the courts have traditionally deferred to the commander in chief. President Clinton issued an executive order that currently governs the appeals process for individuals who have lost their security clearance. But Trump — or any future president — could overturn that executive order and issue one of his own.